Austin Air Allergy Filters, high performance HEPA air purifiers with Carbon Gas, and odor media. 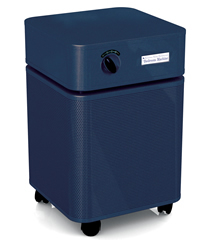 Advanced HEPA Carbon Air Purifier Filter System - one of the best choices for Asthma or Allergies. Austin Air Purifiers are True Medical HEPA, gas / odor air cleaners. CALL 330-497-6900 or 330-497-6900 for the new Austin Air Bedroom Machine ($764.99) or the Austin Air PET MACHINE ($594.99). Designed for the additional needs of pet owners with allergies. Do you need an Austin Air Cleaner? Are you a tough customer? Austin Air has been chosen by the Department of Homeland Security, FEMA, and to aid the victims of the September 11th Terrorist Attacks. The smaller version of the Standard model, the JR is great for areas to 700 sq feet. Perfect for 1-2 rooms, especially the bedroom. Carbon-Zeolite mix and potassium iodide. The HealthMate+™ has an enhanced filtering media that is designed to remove volatile organic chemicals. It is recommended for those who have chemical sensitivity. The Austin Air HealthMate Jr.+™ is the smaller version of the HealthMate+™. It provides greater relief for people with severe chemical sensitivities. Cleans up to 700 sq. ft. providing effective coverage for single rooms. The Austin Air HealthMate Jr.HEGA™ is specifically designed for allergy and asthma sufferers. Using the same military carbon cloth as the Allergy Macine™ the Jr. HEGA cleans up to 700 sq. ft. providing effective coverage for single rooms.